Home Beginner Hacking What is a Spider Trap ? What is a Spider Trap ? Attackers normally use a Spambot for sending spams. A Spambot is an automated program which is used by the attackers to send spam emails to users, send automated posts to various forums or even social networking sites like twitter. Spambots crawl websites for malicious purposes and waste a website’s bandwidth unnecessarily. So, websites use Spider Traps as a countermeasure against those spambots. Spambots request webpages from a webserver several times within a short duration. So, to counter them, a Spider Trap catches spambots and makes them run in some infinite loop. Sometimes, a cyclic directory structure is used. For example : /path/to/directory/again/path/to/directory. As a result, if a spambot starts crawling the website, it will start running in an infinite loop. Some websites use unbounded number of dynamic pages. For example, algorithmically generated poetry or including a calendar. Webpages filled with a large number of characters so that when a lexical analyzer will try to parse it, it will end up crashing. Not all web crawlers are spambots. Sometimes, polite web crawlers crawl websites for indexing purpose. So, a website cannot use Spider Traps to trap all the crawlers it encounters. It needs to differentiate between Spambots and legitimate web crawlers. Polite webcrawlers alternate requests between different hosts. They do not request webpages from same server more than once within a short time frame. So, normally Spam Traps do not affect them much. Moreover, websites with Spider Traps can keep a robots.txt, which can keep enough information so that legitimate webcrawlers do not fall in trap. How Do You Stop a Bad Bot? 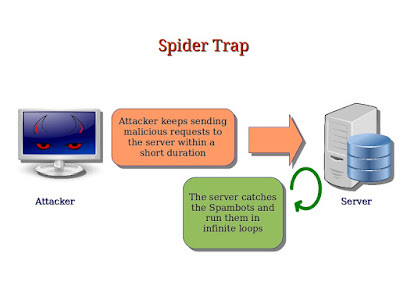 As We Have Understood What Are Spider Trap The internet is crawling with spiders! These spiders, or bots, are automated agents each on a mission to scour the internet for data. Some of these are quite useful. Google would be a boring place if googlebot wasn’t out there gathering information about all the sites for us. But there are many other spiders out there that do nothing but cause trouble. They mine email addresses, steal content, post spam messages and comments, and even look for security vulnerabilities that their masters can later come take advantage of. Even well behaved spiders can cause trouble unintentionally. They can index pages for search engines that you don’t want indexed. They can use vast amounts of bandwidth by downloading every page and every image on your site. They can even slow down your site due to the extra load they create. To curb this, webmasters can create a file called robots.txt that gives instructions on what spiders should index and what they shouldn’t. Well-behaved spiders request this file first and then follow the instructions contained therein when crawling your site. Bad spiders ignore this file entirely and attempt to gobble up your entire site. I recently wrote a little utility to provide me with various stats on my website. I was disgusted at the number of spiders that were crawling my site in violation of the rules defined in my robots.txt file. I decided it was time to do something about it. This file tells all user agents that they have access to everything except for a few directories. Note that one of those directories is named secret. Well-behaved spiders are supposed to read this file and if they do what they are supposed to do, they will never go to this “secret” directory. tells the spider not to index the page and not to follow any links that it finds on the page. A well-behaved spider should see the meta tag telling it to ignore the page and any links on the page and go away. Bad spiders follow the link to “secret.php” where they will be trapped. This is a good time to mention that this code will also trap hackers. If a hacker comes to your site, he will probably check your robots.txt file. He is looking for places you don’t want him to go and here is a file listing those places out for him. I chose the name secret just for this reason. That should immediately get his attention. The hacker then goes to the secret directory and sees the file above. In addition to the meta tag telling the spider to go away, the page displays a message saying that this section is private and asking people to go away. There is a link to “secret.php” for those not wishing to abide by our wishes. This code will add the spider’s IP address (or the hacker’s IP address) to a list of banned IP addresses. It can also email you a message each time someone is added to the list. This is highly recommended. If you want to do that, simply uncomment the appropriate line (change “//mail” to “mail”), and change the address from “you@yoursite.com” to the email address you want to have notified. The code then redirects the offender to another file named “banned.php”. We now have a list of banned IP addresses. But how do we actually ban people that are on the list? Unfortunately, there is no way to include a banned list into an .htaccess file which would be the best way. We will come back to that in a minute. Now, when the spider (or hacker) attempts to access any page, it will instead be redirected to the “banned.php” file. All it does is notify the offender that he is banned. Spiders don’t care but if it is a hacker this let’s them know that they’ve been caught. This method is effect but the proper way to ban an IP address is through the .htaccess file. As I said earlier, we can’t automate that. This is why it is such a good idea to have the secret.php file email you when someone is caught. Every time you receive an email about an intruder, simply add the IP address manually to your .htaccess file. First off, you should not mess with the .htaccess file if you don’t know what you are doing. Find someone who does know what they are doing and ask them to help. Either way, back up the file first! If it is already on, don’t turn it on again. Just add the remaining code after the point where it is enabled. where 111.222.333.444 is the IP address you want to ban. Before adding the above code, look to see if the first two lines already exist. If they do, just add the third line and add it just after those two. Duplicate the “Deny from” for each IP you are banning. Again, the “111.222.333.444” would be replaced by the actual IP addresses that you want to ban. Back everything up before you start! The .htaccess file and robots.txt file need to be in your root directory. The secret directory needs to be in your root directory as well. It will contain: index.php,secret.php, banned.php, and guestlist.log. All but the last are detailed above. You must create a BLANK guestlist.log yourself. If you have trouble, enable your editor to show all characters and make sure you do not have any whitespace characters, such as CR/LF. Once you add an IP to the .htaccess file, you can remove it from the guestlist.log file but there is no need. It should never get large enough to be a problem and it won’t hurt anything to leave it there. If you accidently insert a whitespace character into the file while removing an entry, you could prevent some of the file from being read. Therefore, it really is best to just let the file be. Be sure to change the email address listed in secret.php and uncomment that line. Great article, thank you for taking the time to writ it. Why Learning Programming Is Necessary For Becoming Great HACKER ?